Sew Americana 2017 – Everything Your Mama Made & More! 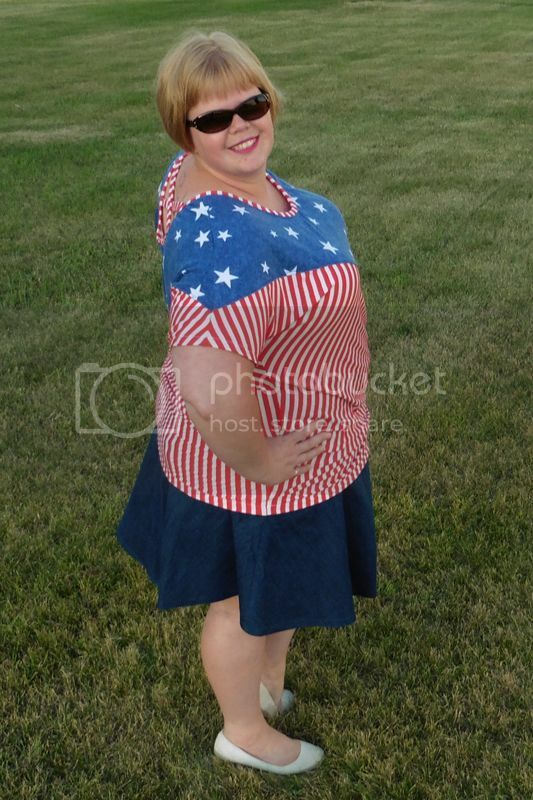 Last year, I “snuck” into the Sew Americana Tour as a last minute addition and had so much fun making myself a red, white, and blue outfit. So, I jumped at the chance to join in again when Katy said she’d decided to make the tour an annual event over at Wild & Wanderful. 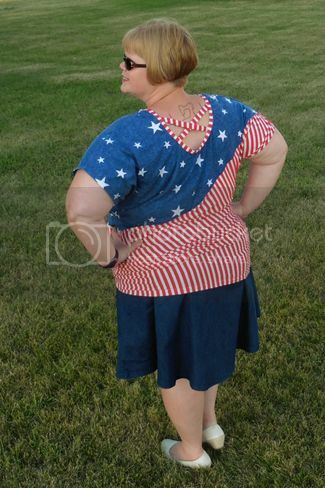 This time, I decided to up the ante on making myself patriotic clothes by adding some stars and stripes to my wardrobe. 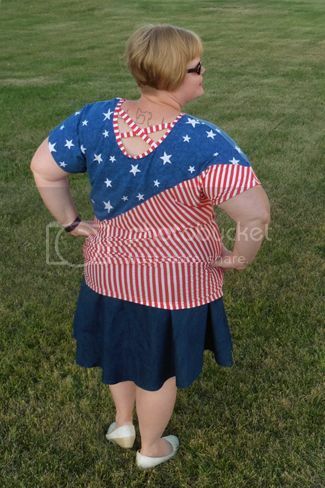 Over a month ago, I bought a yard of poly/spandex fabric printed with white stars on a denim-look blue background and also got some half inch red and white striped poly/spandex, both from So Sew English … and then I let it sit while I tried to pick a sewing pattern that would do them justice. I finally settled on the Asymmetrical Drape Top, but threw my own twists into constructing this fun shirt! Now, I’ve made the Asymmetrical Drape Top with two front necklines before and, while it fits fine, it has a habit of trying to slide off my shoulders if I move around much. So, for my newest version, I decided to add a couple cross-straps to hold the neckline in place. For the straps, I made two fabric tubes using the approximate length of the original back neckline. After applying the neckband, I tacked one strap to the neckband seam allowance about two inches below the shoulder seam on each side. I then tacked the bottom end of each about 3 inches below the opposite strap’s top end. Finally, I topstitched around the neckline seam to help secure the straps in place. I kinda love the end result … such a happy accident! 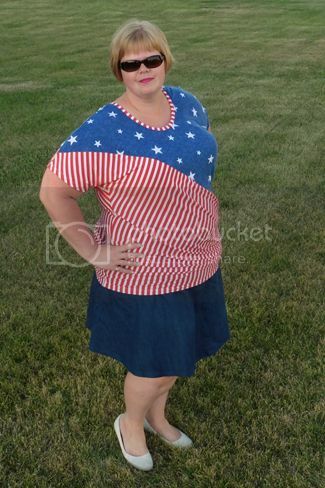 Paired with my denim Capsule Skirt, my new Asymmetrical Drape Top will be perfect for the Fourth of July and beyond! 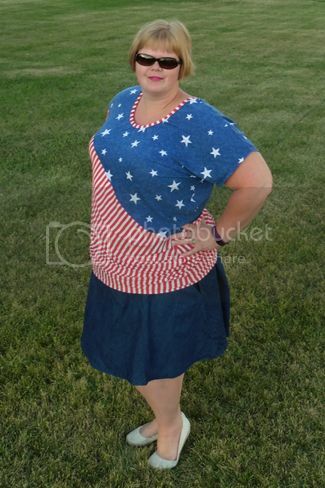 Have you sewn anything red, white, and blue this year? If so, link it up for us to see at the bottom of this post! We would also like to give a special thanks to our generous sponsors! This is FANTASTIC, Joelle. And I’d call that a happy accident, since the cross straps are such a fun addition! Everything about this is so fun. I love the diagonal stripes and the asymmetrical colorblocking. It’s perfection! Thank you … and thanks for hosting this fun tour!! When I saw your teaser image, I thought the straps were an intended element. You did a fabulous job of “making it work”, and the shirt is lovely! I never seem to think about turning stripes on the diagonal, and I wish I would remember to. Great job! Thanks! Once I added them, I definitely love the straps … such a happy accident! You are all ready for the 4th! Love how you altered the pattern. I don’t know what I love more, the shirt or the tattoo!! Joelle, this is the best ‘make-it-work’ ever! I just love those straps! The colorblocking is so good too- totally jealous of your whole outfit! Aww, thanks! I love how it came out, too! I LOVE the straps in the back – such a fun design element! Aaah, I love your back detail Joelle! You always make the coolest stuff. Why do I get the message, “Please update your account to enable 3rd party hosting.”? I can’t see any of your pictures, just the words. 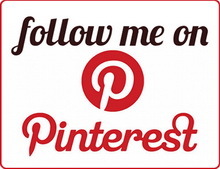 I enjoy your blog and the pictures, love seeing what you’ve made for yourself and your family. Oh, no! I’ll have to get that fixed asap. Sorry! Thank you! I thought it was on my side but when I looked it up saw there was nothing I could do.